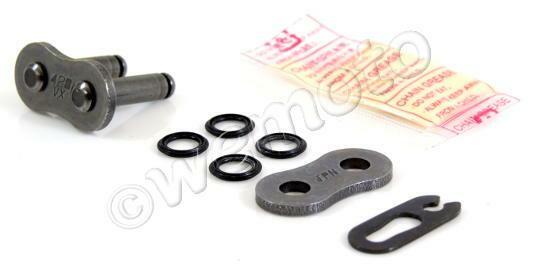 The picture below shows a Chain DID VX Heavy Duty X-Ring Black Spring Link. Thousands of other top quality spares listed on our website at refreshingly low prices. A clip-type connecting link with a light press-fit construction which gives higher fatigue strength than a slip-fit link while still retaining much of the convenience. It requires more pressure to fit than a slip-fit link, but can still be fitted with a pair of pliers as opposed to special riveting tools required for a rivet link. No spring link can attain the strength of a rivet link and the FJ spring link has approximately 65% strength of the other links in the chain. However where a rivet link is not feasible then a press-fit link may be used. DID highly recommends that where possible, a rivet link should be used for any sealed (O-Ring or X-Ring) chains. Press-fit side plates must be pressed on with long-handled, adjustable pliers. Do not attempt to hammer the side plate into position: this can cause stress to the connecting link and cause it to break while in use.